and alcohol than I have been able to with many of my closest family and friends. Although we had never met before, we weren’t strangers; our shared demons gave us a deep sense of knowing. Her work profoundly affected me from the first encounter. ‘The walls that we build to protect ourselves become our prisons’, she wrote in a letter to her younger self that appeared in the August 2007 issue of Psychologies magazine – a statement which made me weep inconsolably even though at the time I didn’t understand why. While I was trapped in the world inside my head, Sally’s words dropped a plumb line into my soul and retrieved a precious gemstone from a long forgotten world. I carried a cutting of the letter in my wallet for at least a year. A nervous breakdown followed not many months later. During those dark days, I devoured the sage (and sometimes stinging) advice that she dispensed in her The Sunday Times Aunt Sally column. Lost and uncertain, each week I would snip the page out and file it away, reassured that however bad things got, I had my own collection of Brampton wisdom to turn to. Around the same time, she published Shoot the Damn Dog, combining a memoir of her depression with advice for fellow sufferers. I added my well-thumbed copy to the burgeoning Brampton archive under my bed. Once back at work and resuming my research on women’s magazines, professional references to Brampton as an iconic editor and journalist joined the collection. 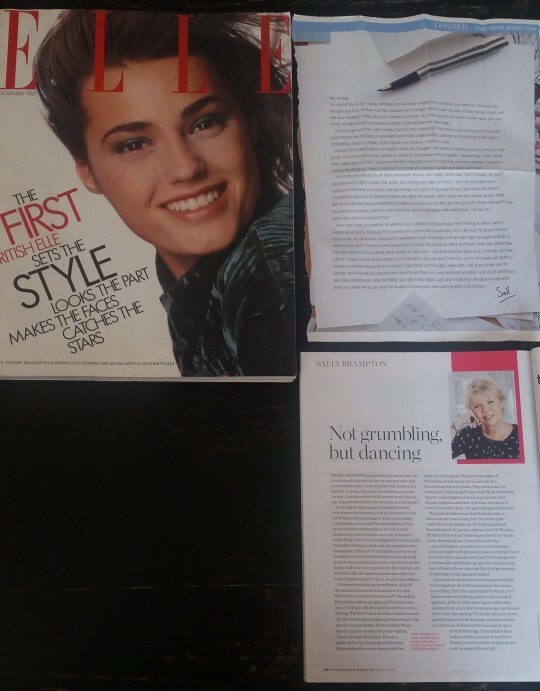 work, acquiring (at some expense) my own copy of Elle’s first UK issue, edited by her, was a joyous moment. In recent years, I’ve often bought publications purely to read her words. I’ve let go of my file of Aunt Sally columns, but the scrap of paper from Psychologies remains always close at hand, one of my most treasured possessions. When I heard yapping at my heels again back in February, I straightaway turned to Shoot the Damn Dog. Sally’s discussion of medication and its uses persuaded me to accept anti-depressants. she long struggled to come to terms with, as have I and as do many others. The misunderstandings surrounding mental health issues often keep those of us who struggle with depression and other illnesses quiet. There also remains stigma, shame, embarrassment, confusion. I fear being labelled as weak, a failure, self-indulgent and, at a time when a close relative is also battling with similar issues, a scene stealer or attention seeker. Despite building a career based upon writing, I cannot find the words to articulate what depression is like or how it makes me feel. Even finding the right words for that sentence involved minutes of nail-picking and a detour to coffee making. help, it just adds a layer of guilt on top of everything else. I’m not ungrateful, I’m ill. Although suicide ideation is a concept that I’ve become all too familiar with again lately, my current depressive episode is relatively mild thus I’ve been able to feel moments of enjoyment and contentment amid it all. The last few months have contained some of the bleakest times of my whole life but some of the happiest too. Imagine you broke your leg just before the holiday of a lifetime and had to spend the trip with a plaster cast and crutches. It is possible to still enjoy yourself, have a great time even, whilst knowing that it would be better – much better – if you didn’t have a broken leg. The dark cloud always casts a shadow, however small. The black dog can always bite, however much you try to exert discipline. The void always threatens to swallow you up, just as the sea has now taken Sally. When you’re living with depression, it touches everything – yet it can be remarkably easy to hide from others. up the shiny, capable, confident front. Business as usual. Indeed some business has continued as usual. I seem to have become adept at doing what I need to do to avoid having to reveal what’s going on underneath it all. Elusive phrases have become common parlance. The unassuming ‘I’d best be going’ uttered when I can feel a plummet approaching and need to get out before the tears begin. The classic ‘I’m fine’ when I’m anything but, or ‘Okay’ when I’m just relieved to have got through the day. Saddest of all is my use of ‘not great’. These two words have been most frequently deployed to cancel social plans I don’t feel I can’t cope with. ‘It’s not been a great week’ or ‘I’m not feeling great’ are deliberately ambiguous, neither lies nor too revealing. By suggesting I’m physically unwell or have overdone it a bit, this pair of phrases excuse me without arousing too many further questions. I regard ‘not great’ as the saddest of these elusive phrases because these are the words that I turn to when I most long to reach out. They are the ones that I use when I really wish I could tell the truth about what’s going on: I’m struggling with depression. The darkness of how I feel, the complexity of it all, gets stuck in my throat and ‘not great’ comes out instead. ‘Not great’ is a protection mechanism, shielding me from the vulnerability that would come with reaching out and sharing my truth honestly and openly. Yet in doing so, it stops me from connecting at a time when connection is what I need most. ‘The walls that we build to protect ourselves become our prisons’. Sally Brampton’s words have played such a critical role in dismantling the walls I’d erected around myself. Now with her death, it feels like it’s time for me to finally step out of the prison – not breaking a sentence but my silence.